Monteverde Cloud Forest is Costa Rica's Paradise! So, What Pleasures You Could Enjoy in Monteverde Cloud Forest? Monteverde Cloud Forest is one of the most beautiful sites in the world. Although Monteverde is small town in Puntarenas province, Costa Rica, it becomes the best destination for tourists as it brings around 500,000 tours every year. The following article covers this beautiful place in the world. If you found it useful, please share it. If you know more information about it, or if you had seen the beautiful site, use the form at the bottom of the page to share it with others. Thank you. The tourism industry in turn supports the national treasury by almost $2.2 billion. In addition to the nature and strategic and beautiful location in Costa Rica, the Cloud Forest, a name it has given, works as a motive in the tourism sector to fill the national treasury by hard currency. The Cloud Forest is a tropical rainforest, which is around 1,700 metres above sea level in central Costa Rica. With its majestic trees festooned with bromeliads, orchids, ferns, creepers and mosses, the Cloud Forest is home to a myriad of rare species of both animals and plants. In Spanish, Monteverde means, "green mountain", and the Cloud Forest is the natural habitat of more than 100 species of mammals and 400 species of bird, including 30 kinds of hummingbird species. Among the tens of thousands of different insect species are over 5,000 species of moth. If one adds 2,500 plant species, including 420 different orchids, then you will have one of the most unique nature reserves in the New World tropics. Over several thousands of years, the ecosystem of Monteverde the Cloud Forest has adapted to the temperature and humidity, which are determined by the cloud cover on the mountains. The humidity is almost 100% most of the year, so any change in temperature and cloud cover would have a serious effect on the ecosystem. If the temperature rises, the clouds will rise higher into the atmosphere. If temperatures increase by 1-2º C over the next 50 years that will have a substantial impact on the diversity and composition of species in tropical cloud forests. Even in areas that experience a relatively low rise in temperature, some species will be threatened with extinction unless they are able to migrate further up the mountain. In 2080, it is expected that Costa Rica will experience a 5-10% decrease in precipitation and a temperature increase of about 2.5º C.
Have you been at Monteverde Cloud Forest or any beautiful place in Costa Rica? Do you know more information about Monteverde Cloud Forest? Use the form below and let's know more. 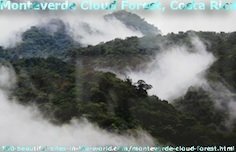 If you found this page about Monteverde Cloud Forest useful, please share it with your services through the following buttons. If you do not have a service there, register for one and enjoy this kind of technology and social networking experiences. Thank you. I use "Solo Build It" at the bottom bar to empower this page about Monteverde Cloud Forest and the entire site, by strong website building and optimizing tools. I love "Solo Build It".